Describe the short term cycling of carbon through the processes of photosynthesis and respiration. Identify carbon sinks and carbon sources. Describe short term and long term storage of carbon. Describe how human actions interfere with the natural carbon cycle. Carbon is a very important element to living things. As the second most common element in the human body, we know that human life without carbon would not be possible. Protein, carbohydrates, and fats are all part of the body and all contain carbon. When your body breaks down food to produce energy, you break down protein, carbohydrates, and fat, and you breathe out carbon dioxide. Carbon occurs in many forms on Earth and is found throughout the environment (Figure below). The element moves through organisms and then returns to the environment. When all this happens in balance, the ecosystem remains in balance too. In this section, let’s follow the path of a carbon atom over many years and see what happens. 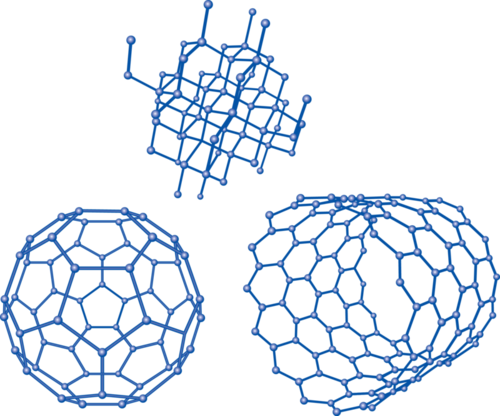 These are some of the structures that carbon takes. Nitrogen is also a very important element, used as a nutrient for plant and animal growth. First, the nitrogen must be converted to a useful form. Without “fixed” nitrogen, plants, and therefore animals, could not exist as we know them. The short term cycling of carbon begins with carbon dioxide (CO2) in the atmosphere. The production of food energy by land plants. Plants and animals engage in the reverse of photosynthesis, which is respiration. In respiration, animals use oxygen to convert the organic carbon in sugar into food energy they can use. Plants also go through respiration and consume some of the sugars they produce. Photosynthesis and respiration are a gas exchange process. In photosynthesis, CO2 is converted to O2 and in respiration, O2 is converted to CO2. Do plants create energy? It is important to remember that plants do not create energy. They change the energy from sunlight into chemical energy that plants and animals can use as food (Figure below). The carbon cycle shows where a carbon atom might be found. The black numbers indicate how much carbon is stored in various reservoirs, in billions of tons (“GtC” stands for gigatons of carbon). The purple numbers indicate how much carbon moves between reservoirs each year. The sediments, as defined in this diagram, do not include the ~70 million GtC of carbonate rock and kerogen. The carbon cycle has been discussed in other chapters. Using what you know, try to answer the following questions. How can a carbon atom cycle very quickly? One way would be if a plant takes in CO2 to make food and then is eaten by an animal, which in turn breathes out CO2. How can carbon be stored for a short period of time? Carbon that is stored as chemical energy in the cells of a plant or animal may remain until the organism dies. At that time, when the organism decomposes its carbon is released back into the environment. How can carbon be stored for a long period of time? If the organism is rapidly buried it may be transformed over millions of years into coal, oil, or natural gas. The carbon may be stored for millions of years. How can carbon be stored for long periods of time in the oceans? Many ocean creatures use calcium carbonate (CaCO3) to make their shells. When these organisms die, their organic material becomes part of the ocean sediments, which may stay at the bottom of the ocean for thousands or millions of years. Eventually, these sediments may be subducted into the mantle. The carbon could cycle back up into the atmosphere: The ocean sediments melt and form magma, and the CO2 is released when volcanoes erupt. Places in the ecosystem that store carbon are reservoirs. Places that supply and remove carbon are carbon sources and carbon sinks. If more carbon is provided than stored, the place is a carbon source. If more carbon dioxide is absorbed than is emitted, the reservoir is a carbon sink. What are some examples of carbon sources and sinks? Carbon sinks are reservoirs where carbon is stored. Healthy living forests and the oceans act as carbon sinks. Carbon sources are reservoirs from which carbon can enter the environment. The mantle is a source of carbon from volcanic gases. A reservoir can change from a sink to a source and vice-versa. A forest is a sink, but when the forest burns it becomes a source. The amount of time that carbon stays, on average, in a reservoir is the residence time of carbon in that reservoir. The concept of residence times is explored using the undergraduate population at UGA as an example. In this example the reservoir is the university (7d): http://www.youtube.com/watch?v=cIuaedcVvQg (2:44). Remember that the amount of CO2 in the atmosphere is very low. This means that a small increase or decrease in the atmospheric CO2 can have a large effect. Scientists have a number of ways to see what atmospheric CO2 levels were in the past. One is to measure the composition of air bubbles trapped in glacial ice. The amount of CO2 in gas bubbles that date from before the Industrial Revolution, when society began to use fossil fuels, is thought to be the natural content of CO2 for this time period; that number was 280 parts per million (ppm). By 1958, when scientists began to directly measure CO2 content from the atmosphere at Mauna Loa volcano in the Pacific Ocean, the amount was 316 ppm (Figure below). In 2009, the atmospheric CO2 content had risen to 387 ppm. 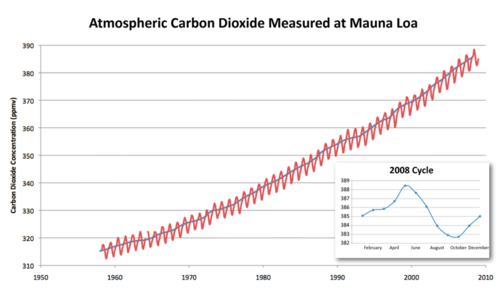 The amount of CO2 in the atmosphere has been measured at Mauna Loa Observatory since 1958. The equation shows that when propane burns, it uses oxygen and produces carbon dioxide and water. So when a car burns a tank of gas, the amount of CO2 in the atmosphere increases just a little. Added over millions of tanks of gas and coal burned for electricity in power plants and all of the other sources of CO2, the result is the increase in atmospheric CO2 seen in the Figure above. The second largest source of atmospheric CO2 is deforestation (Figure below). Trees naturally absorb CO2 while they are alive. Trees that are cut down lose their ability to absorb CO2. If the tree is burned or decomposes, it becomes a source of CO2. A forest can go from being a carbon sink to being a carbon source. 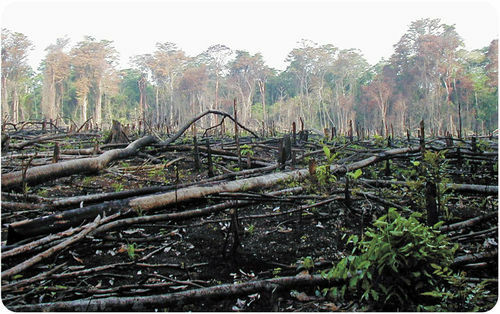 This forest in Mexico has been cut down and burned to clear forested land for agriculture. Coal, oil, and natural gas as well as calcium carbonate rocks and ocean sediments are long term carbon sinks for the natural cycling of carbon. When humans extract and use these resources, combustion makes them into carbon sources. For years, our oceans have absorbed some of the carbon dioxide that humans create through burning fossil fuels. But all that extra CO2 is making our oceans more acidic with potentially dire consequences. Learn more at: http://science.kqed.org/quest/video/acidic-seas/. Why is such a small amounts of carbon dioxide in the atmosphere even important? Carbon dioxide is a greenhouse gas (Figure below) so it absorbs infrared energy, the longer wavelengths of the Sun’s reflected rays. 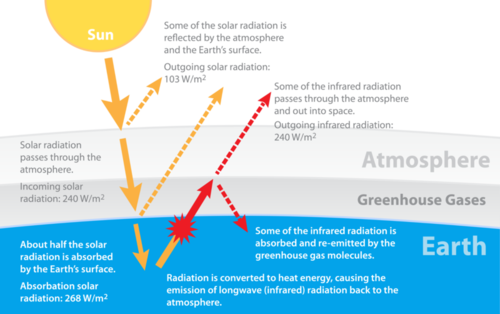 Greenhouse gases trap heat energy that would otherwise radiate out into space and warms Earth. This is like what happens in a greenhouse. The glass that makes up the greenhouse holds in heat that would otherwise radiate out. 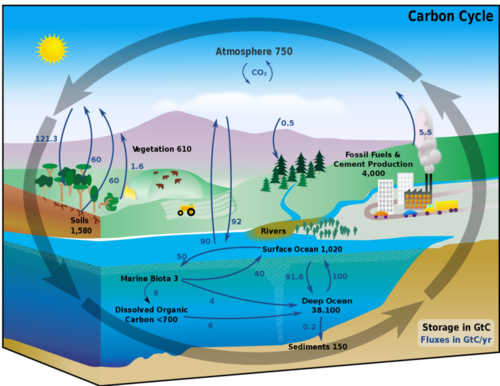 This diagram explains the role of greenhouse gases in our atmosphere. When greenhouse gas levels in the atmosphere increase, the atmosphere holds onto more heat than it normally would. This increase in global temperatures is called global warming. Global warming and the effects of rising temperatures were described in the Climate chapter. This video Keeping up with Carbon from NASA, focuses on the oceans. Topics include what will happen as temperature warms and the oceans can hold less carbon, and ocean acidification (7a): http://www.youtube.com/watch?v=HrIr3xDhQ0E (5:39). A very thorough but basic summary of the carbon cycle, including the effect of carbon dioxide in the atmosphere, is found in this video (7b): http://www.youtube.com/watch?v=U3SZKJVKRxQ (4:37). 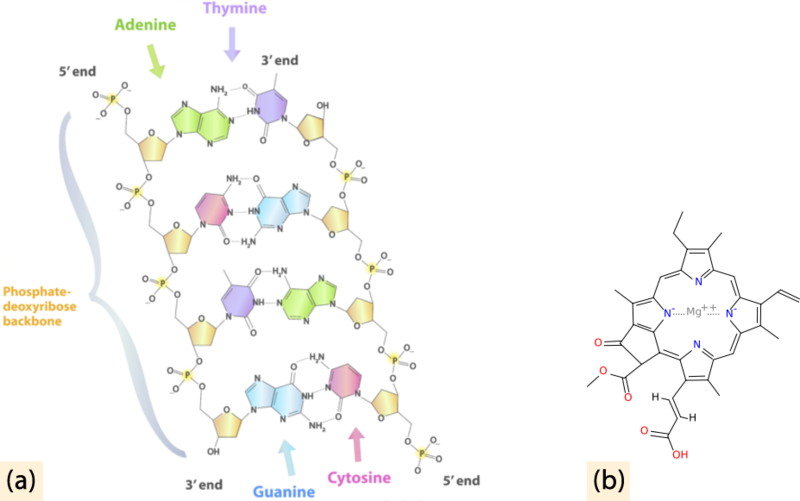 Nitrogen (N2) is also vital for life on Earth as an essential component of organic materials, such as amino acids, nucleic acids, and chlorophyll (Figure below). (a) Nitrogen is found in all amino acids, proteins, and nucleic acids such as DNA and RNA. (b) Chlorophyll molecules, essential for photosynthesis, contain nitrogen. Although nitrogen is the most abundant gas in the atmosphere, it is not in a form that plants can use. To be useful, nitrogen must be “fixed,” or converted into a more useful form. Although some nitrogen is fixed by lightning or blue-green algae, much is modified by bacteria in the soil. These bacteria combine the nitrogen with oxygen or hydrogen to create nitrates or ammonia (Figure below). Nitrogen fixing bacteria either live free or in a symbiotic relationship with leguminous plants (peas, beans, peanuts). The symbiotic bacteria use carbohydrates from the plant to produce ammonia that is useful to the plant. Plants use this fixed nitrogen to build amino acids, nucleic acids (DNA, RNA), and chlorophyll. When these legumes die, the fixed nitrogen they contain fertilizes the soil. Animals eat plant tissue and create animal tissue. After a plant or animal dies or an animal excretes waste, bacteria and some fungi in the soil fix the organic nitrogen and return it to the soil as ammonia. Nitrifying bacteria oxidize the ammonia to nitrites, other bacteria oxide the nitrites to nitrates, which can be used by the next generation of plants. In this way, nitrogen does not need to return to a gas. Under conditions when there is no oxygen, some bacteria can reduce nitrates to molecular nitrogen. Nitrogen from fertilizers may return to the atmosphere as nitrous oxide or ammonia, both of which have deleterious effects. Nitrous oxide contributes to the breakdown of the ozone layer, and ammonia contributes to smog and acid rain. Excess fertilizers run off the land, end up in water, and then cause nitrification of ponds, lakes, and nearshore oceanic areas. The nitrogen “fertilizes” the pond, causing bacteria to grow. When these enormous amounts of bacteria die, their decomposition uses up all the available oxygen (Figure below). Without oxygen, fish and other larger organisms die. This is called a dead zone when it happens on a large scale. (a) Nitrogen runoff into Lake Atitlán, Guatemala, caused an algae bloom in the normally clear blue mountain lake. (b) Fish killed by a lack of oxygen in the water. This very thorough video on the nitrogen cycle with an aquatic perspective was created by high school students (7a): (5:08). Photosynthesis, which transforms inorganic carbon into organic carbon, is an extremely important part of the carbon cycle. Forests and oceans are carbon sinks. When carbon is trapped in ocean sediments or fossil fuels, it is stored for millions of years. Humans have changed the natural carbon cycle by burning fossil fuels, which releases carbon dioxide into the atmosphere. Fossil fuels burning and deforestation are carbon sources. Global warming is a consequence of increased carbon dioxide and other greenhouse gases in the atmosphere. 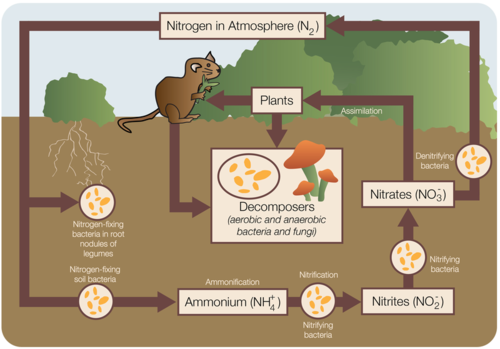 The nitrogen cycle begins with nitrogen gas in the atmosphere then goes through nitrogen-fixing microorganisms to plants, animals, decomposers, and into the soil. Describe the role of carbon in the process of photosynthesis. How can carbon cycle very quickly from the atmosphere and then back into the atmosphere? Describe one way that carbon can be stored for a short time in the natural cycle. Describe two ways that carbon can be stored for a very long time in the natural cycle. Describe what makes a carbon sink and what makes a carbon source; give an example of each. Describe two ways that humans interfere with the natural carbon cycle. Describe two important functions for carbon dioxide in the atmosphere. The impacts of global warming are being felt and will be felt increasingly in your lifetime. What impacts are likely to be seen in the next few decades? Nitrogen is the most abundant gas in the atmosphere. What needs to happen to nitrogen gas before it can be used by living creatures? What is the role of nitrogen in the creation of a dead zone?